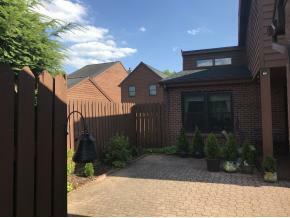 Beautiful end unit townhouse with very spacious and open floor plan! So many major updates including new roof (2 years), new windows, central A/C, water heater & all custom blinds throughout. Newer flooring, private and cozy sunroom overlooks back yard. Wood fireplace in LR/DR. Lower level family room and bonus room have new tile flooring, newly re-done 1/2 bath and large laundry area. Union Endicott High School High School / Public 6 2.43 mi. All Saints School * Pre-School, Elementary School / Private N/A 2.31 mi. George F Johnson Elementary School * Elementary School / Public 4 0.88 mi. Homer Brink School * Elementary School / Public 5 0.86 mi. Maine Endwell Middle School * Middle School / Public 7 0.42 mi. Maine Endwell Senior High School * High School / Public 8 0.12 mi. 101 Patio Drive, Endwell, NY 13760 is a 2 bedroom, 2.5 bath single family home was sold for $135,000.